The papillary and follicular differentiated thyroid cancer (DTC) represents more than 90% of all thyroid cancers. An increasing incidence of thyroid cancer has been recognized around the world during the last few decades. The iodine-131 (I 131) whole-body scan (WBS) and stimulated thyroglobulin (sTg) are the two key modalities currently in practice for follow-up of patients with DTC. The first is utilized to assess residual or recurrence of disease and the second as the tumor biomarker. The data obtained from both modalities together can modify the management and possibly benefit outcome. According to the 7th edition of the American Thyroid Association (ATA) management guidelines for adult patients with thyroid nodules and DTC 2015, patients are divided according to their response to treatment into three groups, excellent response (ER), indeterminate or acceptable response (AR), and incomplete response (IR). An ER was defined as negative imaging results (no evidence of disease [NED]) with very low level of the sTg <1 ng/ml. The indeterminate (acceptable) response was defined as the presence of low serum-sTg level <10 ng/mL or the presence of nonspecific changes in neck ultrasound (US) or nonspecific faint uptake on the whole-body iodine imaging. Finally, the IR may be either structural (local/regional or distal disease evident on imaging examinations) or biochemical (no disease evident) with the presence of elevated sTg ≥10 ng/mL. A biochemical IR is seen in 11%–19% of ATA low-risk patients, 21%–22% of ATA intermediate-risk patients, and 16%–18% of ATA high-risk patients. 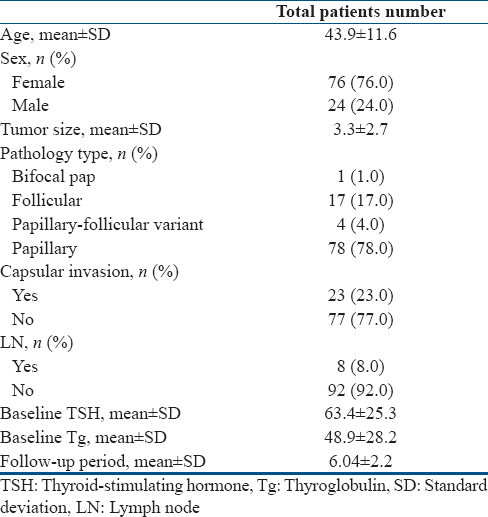 However, the reported outcomes of individuals with detectable Tg levels in the absence of localizable disease and the benefit from repeating thyroid-stimulating hormone (TSH)-sTg testing in this patient population is uncertain and showed wide variation. It is important to define whether the improvement of the response for these patients from biochemical IR to disease-free status was related to further therapies or simply the passage of time. The aim of the study is to evaluate the value of TSH sTg level obtained by the end of the 1st year (9–12 months) after radioactive remnant ablation (RRA) in correlation with I 131 WBS and neck US for the assessment of disease-free status in patients with DTC and biochemical non complete response. We retrospectively studied the medical archives of 100 adult patients treated for DTC and under follow-up at the Oncology and Nuclear Medicine Center, Faculty of Medicine, Cairo and Zagazig University hospitals between January 2009 and December 2017. The enrollment of patients and collection of data were approved by the ethics committee of the board of nuclear medicine at the oncology and Nuclear Medicine Center, Cairo and Zagazig Universities. Informed consent at the time of I 131 treatment was obtained from all patients or their relatives with a full description of the procedures. All patients submitted to near-total thyroidectomy and followed by I 131 (80–120 mCi) ablation of the thyroid remnant. The patients then received TSH suppressive therapy and seen every 4–6 months for follow-up. All patients were subjected to clinical assessment (general and local for evaluation of the health status, assessment of the surgical bed, and cervical lymph nodes [LNs]), neck US, I 131 WBS 4 weeks after eltroxin withdrawal with TSH level more than 30 mU/ml in the hypothyroid state, and sTg level was also estimated in the hypothyroid state. Patients more than 18 years old, had DTC, underwent near-total thyroidectomy, and complete ablation of the thyroid residue. Patients with thyroid carcinoma other than DTC, patients underwent lobectomy or did not undergo surgery before radioactive iodine (RAI) ablation, and patients with unsuccessful ablation (presence of postablative residual thyroid remnant) or metastatic thyroid cancer at presentation. 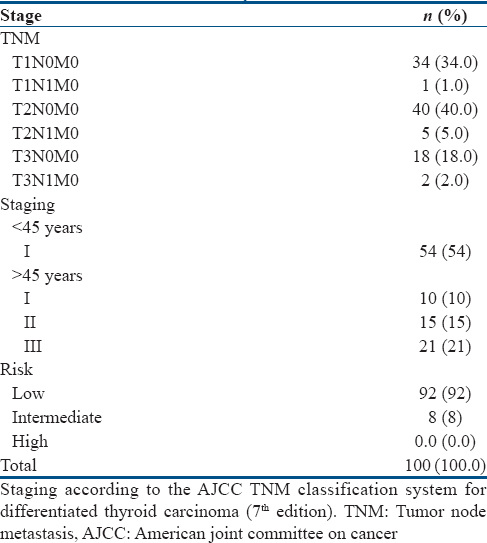 Each patient was classified using the seventh edition of the AJCC/UICC staging system 2015 (tumor-node-metastasis [TNM] Stage I, II, III, or IV and risk stratification). Thyroglobulin measurement – The levels of serum markers including sTg, TgAb, and TSH were checked for all patients in hypothyroid state (under high TSH stimulation) postoperatively and during follow-up on a regular basis. sTg was measured at 4–6 weeks after TSH withdrawal. The sTg level was considered abnormal when its value was higher than 1.0 ng/mL in the hypothyroid state. All sTg values were measured using the radioimmunoassay with reference values 0.83–68.0 ng/mL. Biochemical IR – Patients with postablative elevated sTg more than 10.0 ng/ml. Complete data collected including history, basic clinical examination, laboratory investigations, and outcome measures were coded, entered, and analyzed using Microsoft Excel software. Data were then imported into the Statistical Package for the Social Sciences (SPSS 20, IBM, Armonk, NY, United States of America). Qualitative data was represented as number and percentage while, quantitative continuous data was represented by mean ± standard deviation. Chi-square test was used to test differences and association of qualitative variables. Differences between quantitative independent groups was done by Mann–Whitney U test. P value was set at <0.05 for significant results, and <0.001 for high significant result. The current study included 100 patients; 76 (76%) females and 24 (24%) males with a mean age of 43.9 ± 11.6 years and range 21–63 years, with more than half of them less than 45 years old (54%). All patients had DTC 79 (79%) papillary, 17 (17%) follicular, and 4 (4%) papillary-follicular type. They underwent near-total thyroidectomy and I 131 RRA at a dose range of 80–120 mCi under high TSH stimulation >30 micro IU/ml (mean 63.4 ± 25.3 micro IU/ml) in a hypothyroid state. TSH-stimulated baseline sTg was measured as a reference with mean value 48.9 ± 28.2 ng/ml. On reviewing the surgical and pathology reports, only 8 (8%) patients had LN metastasis and 23 (23%) patients had capsular invasion. All patients were free from vascular invasion, extrathyroidal extension, or distant metastasis; the clinicopathological features of our patients are shown in [Table 1]. According to the seventh edition of AJCC TNM Classification System for Differentiated Thyroid Carcinoma 2015, about two-thirds (64%) of patients were Stage I, 15 (15%) patients Stage II, and 21 (21%) patients Stage III. In respect to risk classification, most patients (92/100) were in the low-risk category and 8/100 patients in the intermediate-risk category and no patient in the high-risk group [Table 2]. It is noticed that the mean sTg level was highest at the baseline (48.9 ± 28.2 ng/ml) and the lowest at the last follow-up, years after ablation (1.6 ± 1.8 ng/ml). There was continuous decrease in the mean values of sTg through the serial follow-ups with the most significant decrease between the mean baseline sTg value (48.9 ± 28.2 ng/ml) and the first follow-up sTg mean value (23.3 ± 24.4 ng/ml) (P = 0.000), followed by the decrease from the first follow-up mean value to the second follow-up mean value (from 23.3 ± 24.4 ng/ml to 13.2 ± 35.2 ng/ml, P = 0.000); however, there is less statistically significant difference between the mean value of second sTg and the last sTg follow-up mean value (from 13.2 ± 35.2 ng/ml to 1.6 ± 1.8 ng/ml, P = 0.009) [Figure 1]. The posttherapy scan (done 5 to 7 days after I 131 ablative doses) showed small residual active thyroid tissue in the surgical bed in 99 (99%) patients and bulky residual thyroid tissue in only 1 (1%) patient. Evidence of LN activity was seen in 3 (3%) patients. All patients displayed complete structural response on the first follow-up I 131 WBS and neck US done 6 months after receiving ablative dose of I 131, while measurement of TSH-stimulated serum Tg level at the same time revealed ER in 3 patients, AR in 29 (29%) patients, and unfortunately 68 (68%) patients still have biochemical IR (high sTg level >10 ng/ml). Patients with indeterminate and biochemical IR received no treatment and subjected to follow-up for variable period ranges from 3 to 10 years with mean value 6.04 ± 2.2 years. A second I 131 WBS, neck US, and TSH sTg level assessment after 9–12-month postablation were done for all patients and showed dramatic biochemical response with ER, indeterminate, and IR in 50 (50%), 34 (34%), and 16 (16%) patients versus 3 (3%), 29 (29%), and 68 patients (68%) in the 1st follow-up, respectively. This change is highly statistically significant (P = 0.00). I 131 WBS/neck US and TSH sTg were repeated at 6–12-month intervals for years thereafter based on the clinical course of the disease and the risk of the individual patient. 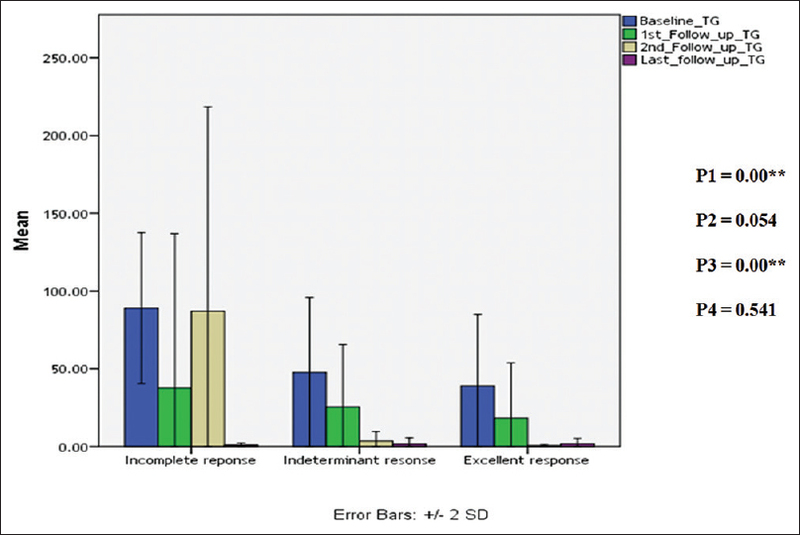 During the last follow-up, all patients showed ER and indeterminate response (53 [55.8%] patients and 42 [44.2%] patients, respectively) and no body with biochemical IR noted, as all of them (11 patients after subtraction of the lost 5 patients with de-DTC) achieved significant improvement to ER and indeterminate response. The change in patients with IR between the second and the last follow-up is statistically significant (P = 0.001) [Figure 2]. Concordance between I 131 WBS and sTg was seen in 59 patients (59%) (50 patients had negative I 131 WBS with excellent biochemical response and 9 patients had positive I 131 WBS and indeterminate or incomplete biochemical response). Discordance was seen in 41 (41%) patients that had negative I 131 WBS and indeterminate or biochemical IR; these figures had statistically significant difference (P = 0.001) [Table 3]. Structural recurrence was seen in 14 (14%) patients, all of them had indeterminate and incomplete biochemical response. Out of them, five patients had false-negative I 131 WBS and showed local recurrence by neck US and high sTg level. Positron emission tomography-computed tomography study and histopathological examination were also done for these patients and confirmed the development of dedifferentiation of their tumors. They were referred to oncology department and lost from our follow-up. The remaining nine patients with structural and biochemical IR achieved complete structural response during the third follow-up several years after receiving therapeutic dose of I 131 ranged from 80 to 150 mCi. On reviewing the sTg level of the 14 patients with structural recurrence compared to the rest of patients, it was found that they had higher baseline, first, and second follow-up serum levels with statistically significant difference for the baseline and second Tg follow-up values (P = 0.00**). The mean value of the last follow-up done years later at the time they achieved complete structural response was comparable to that of the rest of patients, and no patient had incomplete biochemical response (P = 0.322) [Table 4]. By the end of the 1st year, it was found that the highest percentage of ER was in Stage I 41 (41%) patients, particularly those with age <45 years old (33/50) and the highest percentage of indeterminate and IR was in Stage II (9%) and III (7%), respectively, and this difference in patients distribution is statistically significant (P = 0.0018) [Table 5]. The mean baseline sTg value was highest in patients who had biochemical IR and lowest in those who had ER. Patients with biochemical IR showed marked decrease of their mean sTg value and most of them was shifted to indeterminate (acceptable) response also, patients with indeterminate response revealed more reduction of their mean sTg value at the last follow-up. This refers to that patients with biochemical IR still have the chance to achieve excellent or AR by passage of time without additional therapies. There was statistically significant differences among the three groups, namely, the excellent, the indeterminate, and IR (P = 0.00) in the mean baseline and second follow-up sTg but no statistically significant difference in the first and the last follow-up mean sTg values (P = 0.054 and 0.541) [Figure 3]. sTg measurement by the end of the 1st year is a more reliable test in the follow-up of patients with DTC and biochemical non complete response and considered significant predictor of disease-free status in these patients. Patients with biochemical IR (Tg >10 ng/ml) without structural evidence of disease have a high probability of having disease-free status without any additional therapy. Davies L, Welch HG. Current thyroid cancer trends in the United States. JAMA Otolaryngol Head Neck Surg 2014;140:317-22. Kumar V, Abbas AK, Astar JC. Robbins and Cotran Pathologic Basis of Disease. 9th ed. Philadelphia: Elsevier Saunders; 2014. Kim TY, Kim WB, Kim ES, Ryu JS, Yeo JS, Kim SC, et al. Serum thyroglobulin levels at the time of 131I remnant ablation just after thyroidectomy are useful for early prediction of clinical recurrence in low-risk patients with differentiated thyroid carcinoma. J Clin Endocrinol Metab 2005;90:1440-5. Tuttle RM, Leboeuf R. Follow-up approaches in thyroid cancer: A risk adapted paradigm. Endocrinol Metab Clin North Am 2008;37:419-35, ix-x. Vaisman F, Momesso D, Bulzico DA, Pessoa CH, Dias F, Corbo R, et al. Spontaneous remission in thyroid cancer patients after biochemical incomplete response to initial therapy. Clin Endocrinol (Oxf) 2012;77:132-8. Pitoia F, Abelleira E, Tala H, Bueno F, Urciuoli C, Cross G, et al. Biochemical persistence in thyroid cancer: Is there anything to worry about? Endocrine 2014;46:532-7. Biko J, Reiners C, Kreissl MC, Verburg FA, Demidchik Y, Drozd V, et al. Favourable course of disease after incomplete remission on (131) I therapy in children with pulmonary metastases of papillary thyroid carcinoma: 10 years follow-up. Eur J Nucl Med Mol Imaging 2011;38:651-5. Hasbek Z, Turgut B, Kilicli F, Altuntas EE, Yucel B. Importance of postoperative stimulated thyroglobulin level at the time of 131I ablation therapy for differentiated thyroid cancer. Asian Pac J Cancer Prev 2014;15:2523-7. Pacini F, Capezzone M, Elisei R, Ceccarelli C, Taddei D, Pinchera A, et al. Diagnostic 131-iodine whole-body scan may be avoided in thyroid cancer patients who have undetectable stimulated serum Tg levels after initial treatment. J Clin Endocrinol Metab 2002;87:1499-501. Lamartina L, Montesano T, Trulli F, Attard M, Torlontano M, Bruno R, et al. Papillary thyroid carcinomas with biochemical incomplete or indeterminate responses to initial treatment: Repeat stimulated thyroglobulin assay to identify disease-free patients. Endocrine 2016;54:467-75. Yim JH, Kim EY, Bae Kim W, Kim WG, Kim TY, Ryu JS, et al. Long-term consequence of elevated thyroglobulin in differentiated thyroid cancer. Thyroid 2013;23:58-63. Castagna MG, Maino F, Cipri C, Belardini V, Theodoropoulou A, Cevenini G, et al. Delayed risk stratification, to include the response to initial treatment (surgery and radioiodine ablation), has better outcome predictivity in differentiated thyroid cancer patients. Eur J Endocrinol 2011;165:441-6. Baudin E, Do Cao C, Cailleux AF, Leboulleux S, Travagli JP, Schlumberger M, et al. Positive predictive value of serum thyroglobulin levels, measured during the first year of follow-up after thyroid hormone withdrawal, in thyroid cancer patients. J Clin Endocrinol Metab 2003;88:1107-11. Pineda JD, Lee T, Ain K, Reynolds JC, Robbins J. Iodine-131 therapy for thyroid cancer patients with elevated thyroglobulin and negative diagnostic scan. J Clin Endocrinol Metab 1995;80:1488-92. Alzahrani AS, Mohamed G, Al Shammary A, Aldasouqi S, Abdal Salam S, Shoukri M, et al. Long-term course and predictive factors of elevated serum thyroglobulin and negative diagnostic radioiodine whole body scan in differentiated thyroid cancer. J Endocrinol Invest 2005;28:540-6. Tuttle RM, Tala H, Shah J, Leboeuf R, Ghossein R, Gonen M, et al. Estimating risk of recurrence in differentiated thyroid cancer after total thyroidectomy and radioactive iodine remnant ablation: Using response to therapy variables to modify the initial risk estimates predicted by the new American Thyroid Association staging system. Thyroid 2010;20:1341-9. Vaisman F, Bulzico DA, Pessoa CH, Bordallo MA, Mendonça UB, Dias FL, et al. Prognostic factors of a good response to initial therapy in children and adolescents with differentiated thyroid cancer. Clinics (Sao Paulo) 2011;66:281-6.